Locales configuration Provision of the configuration for defining which languages are available to users in the “Change Language” section. ResourceBundleService Description of the ResourceBundleService configuration. Navigation resource bundles Description of the language configuration for navigation. Portlets Description of the language configuration for portlets. Translating the language selection form Instructions on how to translate a language in the Interface Language Setting. eXo Platform is fully configurable for internationalization; however, users should have a general knowledge of Internationalization in Java products before attempting these configurations. Oracle Java hosts a comprehensive guide to internationalize Java products `here <http://docs.oracle.com/javase/tutorial/i18n/TOC.html>http://docs.oracle.com/javase/tutorial/i18n/TOC.html>`__. All eXo Platform applications contain property files for various languages. They are packaged with the portlets applications in a WEB-INF/classes/locale/ directory. These files are located in the classes folder of the WEB-INF directory to be loaded by the class loader. All resource files are in a subfolder named locale. For example, the translations for the NavigationPortlet are located in web.war/WEB-INF/classes/locale/portlet/portal. There are also properties files in the portal itself. They form the portal resource bundle. From a portlet, you can then access translations from the portlet itself or shared at the portal level, both are aggregated when you need them. Various languages are available in the portal package. 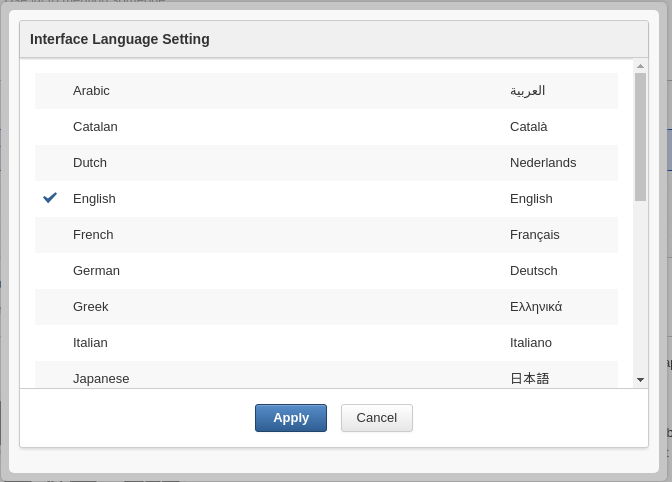 The configuration below will define which languages shown in the “Change Language” section and made available to users. locale: This has to be defined, such as ` http://ftp.ics.uci.edu-pub-ietf-http-related-iso639.txt <http://ftp.ics.uci.edu-pub-ietf-http-related-iso639.txt>`__. In this example, “ar” is Arabic. output-encoding: This deals with the character encoding. It is recommended that UTF-8 be used. input-encoding: In the Java implementation, the encoding parameters will be used for the request response stream. The input-encoding parameter will be used for requesting setCharacterEncoding(..). description: Brief description of the language. orientation: The default orientation of text and images is Left-To-Right. eXo Platform supports Right-To-Left orientation. Modifying the text orientation is explained in ?. classpath.resources: This is discussed in the later section. init.resources: Initiates resources related to portal, group, user resource bundle. portal.resource.names: Defines all resources that belong to the Portal Resource Bundle. These resources are merged into a single resource bundle which is accessible from anywhere in eXo Platform. All these keys are located in the same bundle, which is separated from the navigation resource bundles. There is a resource bundle for each navigation. A navigation can exist for user, groups and portal. The previous example shows bundle definitions for the navigation of the classic portal and of four different groups. Each of these resource bundles occupies a different sphere, they are independent of each other and they are not included in the portal.resource.names parameter. The properties for a group must be in the WEB-INF/classes/locale/navigation/group/ folder. For example, /WEB-INF/classes/locale/navigation/group/organization/management/executive-board_en.properties. The folder and file names must correspond to the group hierarchy. The group name “executive-board” is followed by the ISO 639 code. Each language defined in LocalesConfig must have a resource file defined. If the name of a group is changed, the name of the folder and/or files of the correspondent navigation resource bundles must also be changed. This resource bundle is only accessible for the navigation of the organization.management.executive-board group. Portlets are independent applications and deliver their own resource files. All shipped portlet resources are located in the locale/portlet subfolder. The ResourceBundleService parameter called classpath.resources defines this subfolder. Create the GadgetPortlet_es.properties file in: WEB-INF/classes/locale/portlet/gadget/GadgetPortlet. See the portlet specification for more details about the portlet internationalization. The portlet specifications define three standard keys: Title, Short Title and Keywords. Keywords are formatted as a comma-separated list of tags. When translating an application, it can sometimes be important to find out which key underlies some given labels in the user interface. eXo Platform offers the Magic locale to handle such situations. You can start the Portal in debug mode and use the Magic locale from the list of available portal languages to assist in finding the correct translated key value. This special locale translates a key to the same value. For example, the translated value for the “organization.title” key is the “organization.title” value. Selecting Magic locale allows use of the portal and its applications with all the keys visible. This makes it easier to discover the correct key for a given label in the portal page. Open http://localhost:8080/portal/classic to display eXo Platform landing page. Select ma from the list of available languages to activate the Magic locale. When choosing a language as on the screenshot above, the user is presented with a list of languages on the left side in the current chosen language and on the right side, the same language translated into its own language. Those texts are obtained from the JDK API java.util.Locale.getDisplayedLanguage() and java.util.Locale.getDisplayedCountry() (if needed) and all languages may not be translated and can also depend on the JVM currently used. It is still possible to override those values by editing the locale.portal.webui resource bundle. To do this, edit the gatein.ear/portal.war/WEB-INF/classes/locale/portal/webui_xx_yy.properties where xx_yy represents the country code of the language in which you want to translate a particular language. In that file, add or modify a key, such as Locale.xx_yy with the value being the translated string. After a restart, the language will be updated in the user interface when a user is trying to change the current language.